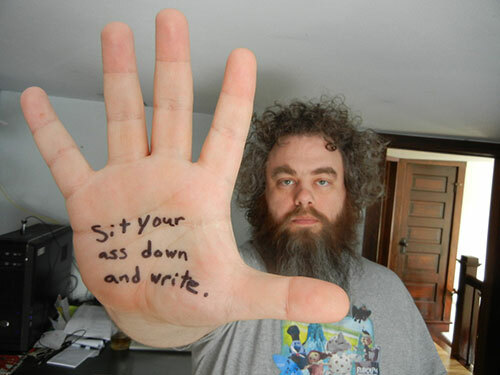 Every writer needs a little encouragement along the way. A helpful word of advice from people who’ve been there can be especially helpful. 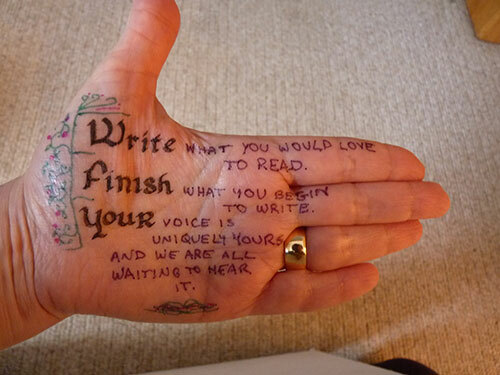 The very groovy people at Shared Worlds have asked some of fiction’s writers, editors and artists write down some words of wisdom on their hands and take a picture. I love this. Neil Gaiman is one of my favorite people. I’ve only read a few of his books but I’ve been reading his blog and following him on Twitter for a while. I actually got to meet him in June while he was on his book tour for ‘Ocean at the End of the Lane’. He spoke for about an hour and a half before the book signing and as always, he was funny and smart , and really quite amazing. 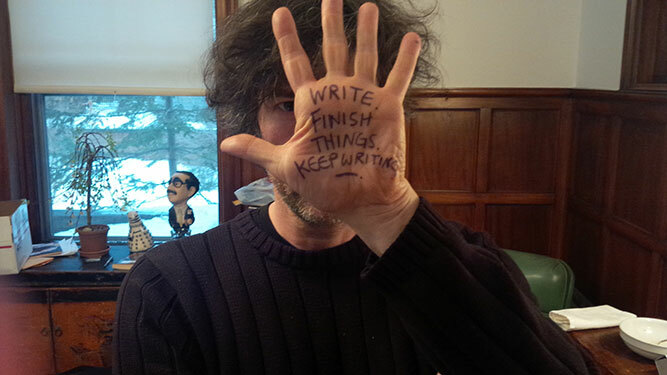 I love his hand-written advice. It really does play on what I truly need to do. 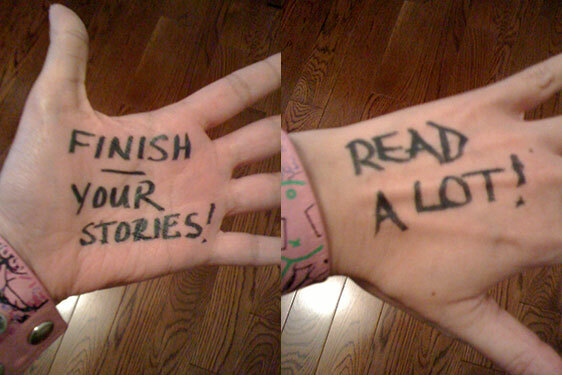 I need to write, finish what I am writing and keep writing. Shared Worlds is a creative writing experience offered to high school students by Wofford College in South Carolina. You can see the rest of the Hand in Hand advice here. It might still be summertime here in sunny Arizona but we are already looking ahead to the fall. Last night I was going through the mail that had accumulated while we were on vacation, we got a flyer from Disney advertising the different events coming up in the fall. 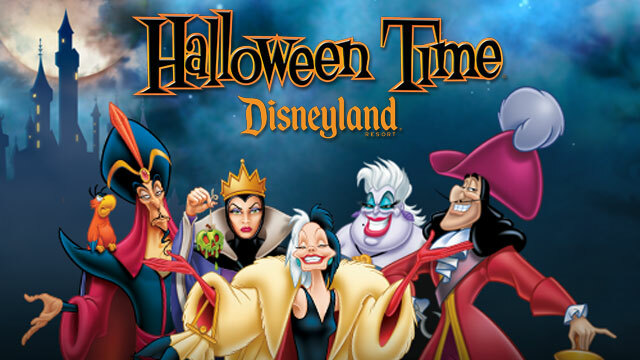 When we were at Disneyland last October we saw a lot of people participating in the Halloween festivities and it looked like a lot of fun. Sully saw the flyer and asked about what dates things were happening. I did more research online at the Disneyland website. We discussed dates, checked our calendars and Sully requested the time off work. 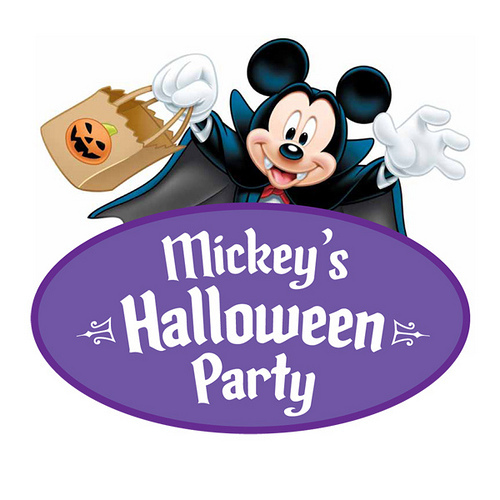 So guess where we are going in October? We were planning on dressing as pirates this year so it works out perfectly. It’s totally silly but I am really excited! I spent most of the day doing things in pieces. As soon as I woke up, I got dressed and went out to the garage to add a second coat of paint to the counter top piece of MDF. I knew we had to run errands and figured the paint could dry while we were out and about. I knew that I needed to work on putting in the shelves and counter before the Super Bowl started. Most of the afternoon was spent putting in the support boards for the shelves and counter. It took a lot longer than I had planned, granted I had a lot to do and a few interruptions. I brought the counter in about twenty minutes before the game started but soon found out that it wouldn’t slide in. I had to remove the lower shelf first, which was the original shelf. I was afraid that the builders had used 500 nails to attach it to the support boards. Those guys get trigger happy with the nail gun. I was in luck though there were only a few nails that I had to hammer out. Sully ended up having to help me with the counter. I had to do a special cutout to make room for the actual switches for the lights. I still can’t believe that I missed that, it didn’t even occur to me that they would cause an issue with installing the counter piece. Of course, I was hoping that I would be able to tip the counter piece in without messing with the middle shelf. Live and learn, right? 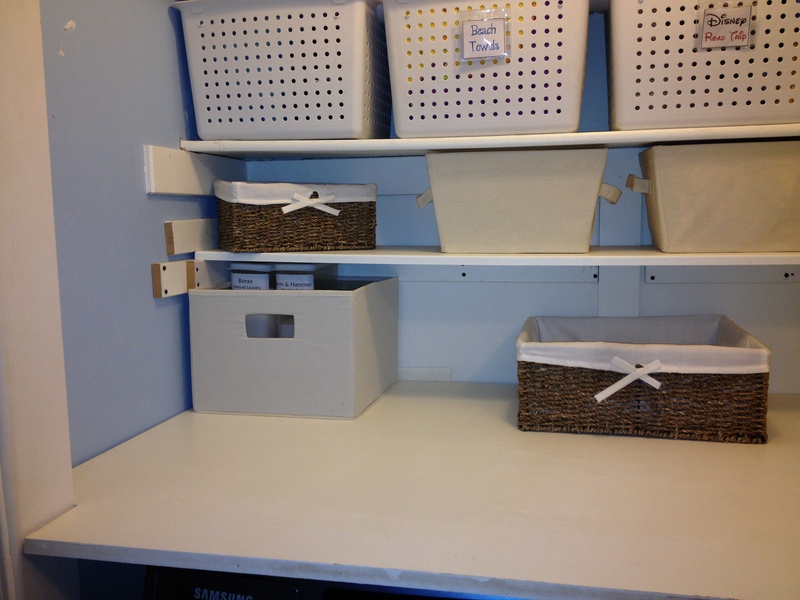 Here is what it looks like with the bins and baskets that I bought after Christmas. Those are on the counter and the lowest shelf. The plastic bins at the top of the picture will be covered at a later date. 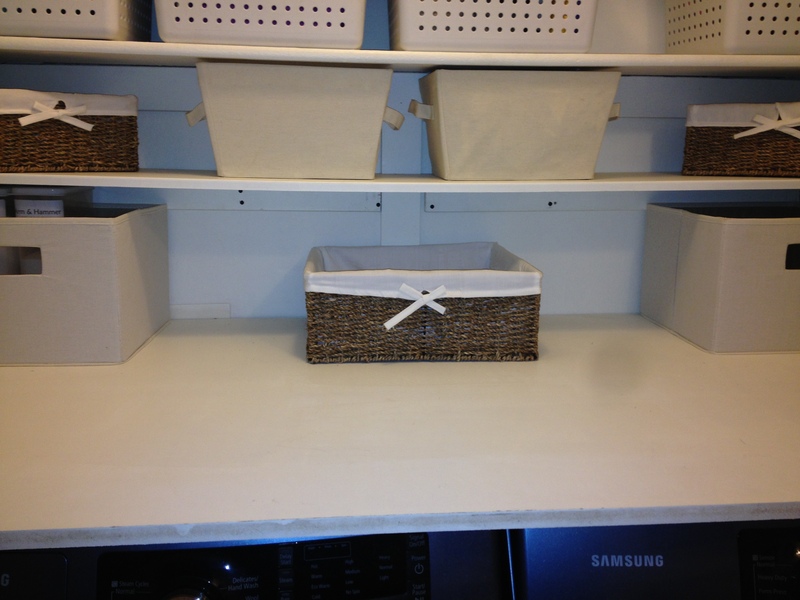 The baskets and bins are completely empty at this point. I was just excited to see how they looked in this new space. There’s still a fair amount of work to do until I can call it done but I am really happy that I have gotten to this point. The counter was such a pain to get in and it scratched up the walls a fair amount. So, in addition to organizing everything I will have to do a bit of touch up painting and I really would like to add some curtains to cover the upper shelves. Overall, the basic setup has been fun. I really can’t wait to see what it looks like with curtains and some decorations. Yay! I spent the day working in the laundry area, up and down the ladder and laying across the washer and dryer using the drill in all sorts of crazy positions. I am worn out and there was no walk. My morning and night routines are going well. I suppose I should try to get to sleep earlier in the night. I will have to work on that. Happy solstice! Today is the longest night and the shortest day. As it gets colder and darker in many places, light a candle to symbolize the light in the midst of the dark. Lift your spirits and extend that light and warmth to those around you. Special thanks to Deborah Blake, check out her blog at Writing the Witchy Way for more information on the solstice. may this Winter Solstice bring you moments of peace and reflection. Wishing you a wise Winter Solstice this year. It started the first year in our new house. Sully and I had been married for just over a year, Boo was just barely a month old. We’d held Thanksgiving at our house with seventeen people at our house. 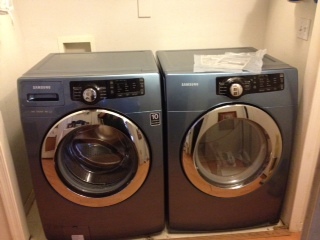 It went fairly well with minor complications, mostly from the new mom and baby. All in all it was a good time and the next day all of the parents wanted to go shopping for Black Friday. Sully and I don’t do that so we invited all of the nieces and nephews over for movies and fun. My parents offered to bring over lunch and when they came over they brought us a Christmas tree that they had bought at Michael’s. Sully and I were shocked, it was honestly one of the most thoughtful and sweet gifts my parents had ever gotten me. We still put up that same tree, branch by branch. It’s looking a bit sparse and everyday I sweep up little plastic needles. 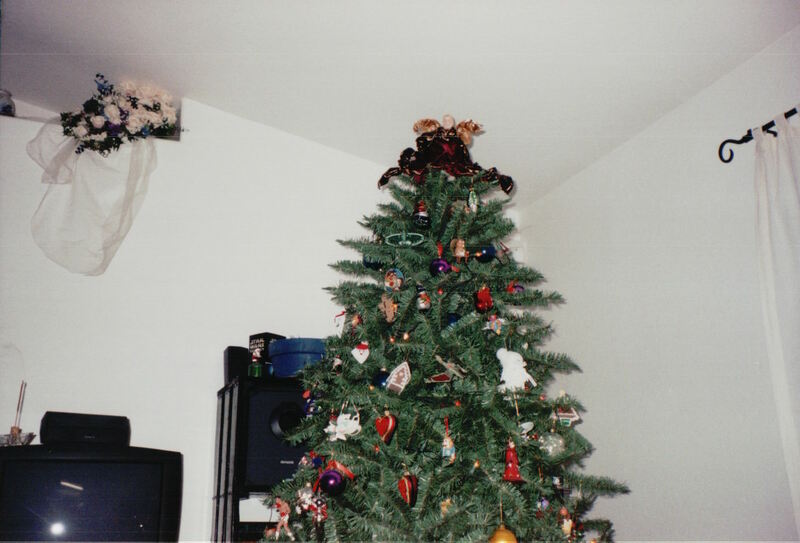 Here is a picture from 2001, the first year we got it. Not sure what’s up with the angle. I was going to crop the picture but that’s my wedding bouquet up on the shelf to the left. Ok, here I go off on a tangent… I decided to make my own bouquet because I knew what I wanted it to look like. I also figured if I was going to spend time and money on something that was so pretty that I wanted it to last and not die. That sentiment ties in nicely to our Christmas tree too.. Here is a picture from last year. I would love to have a pre-lit tree that you can set up quickly.This year though, we aren’t quite ready to let go of this tree. Maybe next year we will get a new tree and put this tree up in the school room. I am looking forward to an amazing holiday season. Wishing this for everyone else too. 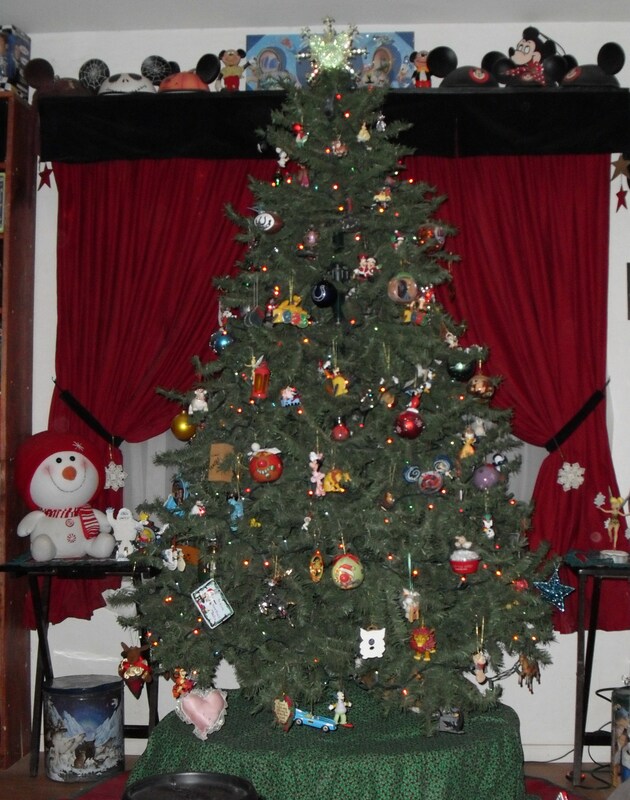 ** We put up an artificial tree because I am really allergic to live trees, my whole family is too. It takes about five days for respiratory symptoms to start then a couple of days later bronchitis sets in, after that you might as well drive me to the hospital. Or so my dad always said, after the bronchitis I was usually away from whatever tree was affecting me at school or work. I’ve always liked Velcro. When I was a kid I loved that ripping sound it makes when you pull the two pieces apart. It was great on bags, wallets and I remember being terribly excited that there was Velcro on my Trapper Keeper. Now that I am older, I have found myself once again loving the Velcro. I use it all over the house. We use these Velcro straps to wrap up cords around the house. It’s great for the powercords for the camera, GPS and other things that aren’t charged every week. 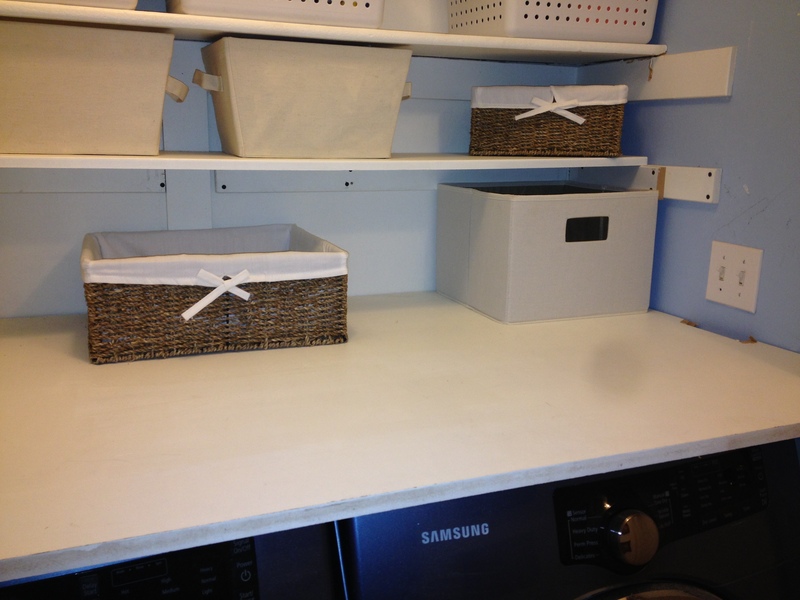 It keeps everything together and saves a lot of room in the drawer or container. We also use them to bundle up the excess length of cord on stuff like the computer, where there are multiple cords in the same area. It alleviates all of the tangling and neatens it all up. I use Velcro dots for sewing and around the house. You can find them in various colors, sizes and shapes. I used one in my iPad case to keep the flap tight so that my iPad doesn’t slide around. I added a detachable pocket to a bag using these larger oval dots. I use nametag sleeves to hold labels on containers, that way I can just pull the label out and put a new one in, or move the label to another box. The industrial strength Velcro is perfect for attaching the sleeves to the containers. This Velcro is made to withstand heavy weights but I use itbecause it also does really well in the heat. I use nametag sleeves to hold labels on containers, that way I can just pull the label out and put a new one in, or move the label to another box. The industrial strength Velcro is perfect for attaching the sleeves to the containers. This Velcro is made to withstand heavy weights but I use it because it also does really well in the heat. In Arizona, our garage gets super hot, the adhesive on normal Velcro just melts and I find my labels on the floor. I’ve never had a problem with the industrial strength Velcro. Here is my latest favorite thing. 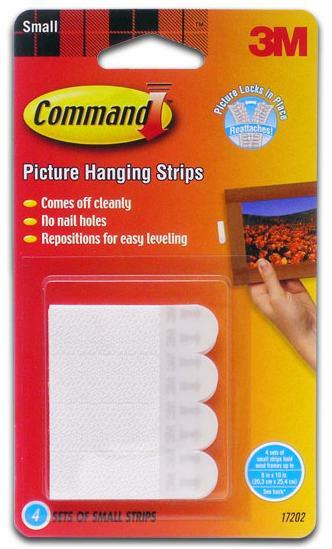 These picture hanging strips are great. I’ve used these so much in the past few months. I hung a whole wall of picture frames last month, ranging from 3×5″ to 24 x 36″. Then I used them to attach my USB hub, USB router and surge protector on the wall so that I have more desk space. I haven’t had any issues with them at all. The packages have a guide on the back indicating which strips and how many to use on the different frame sizes. I’ve used them to hang a calendar, two dry erase boards, my earring holder and probably ten other things that are not coming to mind right now. So, Tuesday night, we relaxed for a bit after Sully’s long day at work. He reminded me that we were doing our birthday gift exchange. In my worry about how he was doing during the day I had completely forgotten. Boo and I dashed out to pick up Panda Express for dinner. We exchanged gifts before dinner because Sully couldn’t wait any longer for me to open my gift. Look! 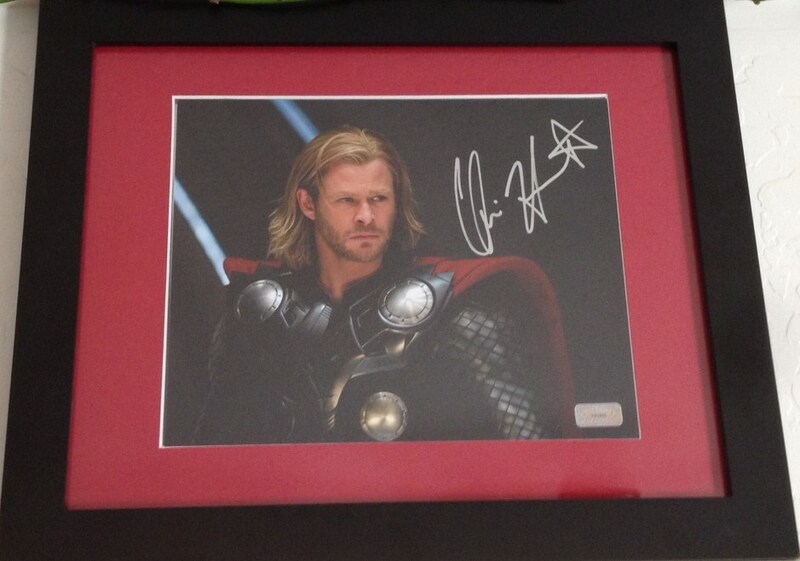 A framed still from ‘Thor’, autographed by Chris Hemsworth. 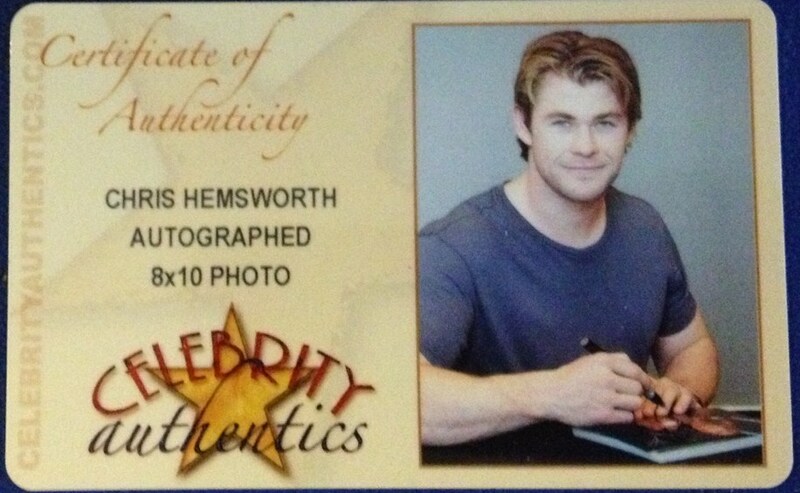 It even came with a Certificate of Authenticity card with a picture of Chris Hemsworth signing the movie still. It’s so beyond awesome. Thank you to Boo and Sully! They are the best. 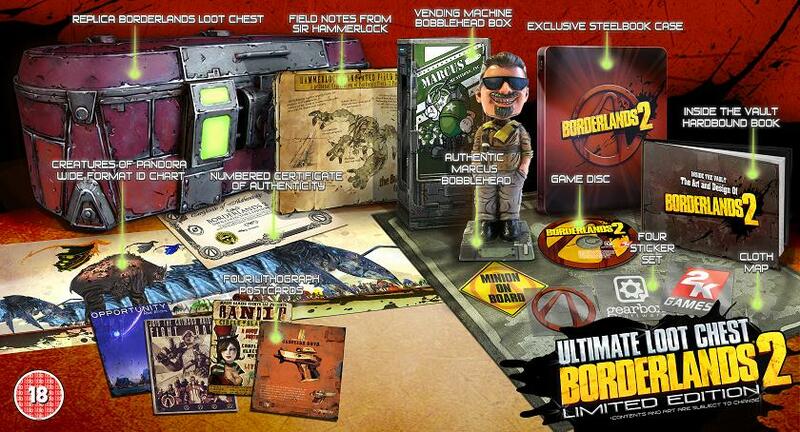 Boo and I got Sully a video game, Borderlands 2. He wanted the super cool deluxe set so he pre-ordered it sometime over the summer and it came out today. The last part being the main reason that we are celebrating our birthdays a week ahead of time. Sully ooh’d and ahh’d over all of the nifty things in the set.